The story of the Grauballe Man started a long, long time ago, but his more recent discovery occurred in 1952 in Jutland, Denmark. The 2,000-year-old man was found nearly perfectly preserved by two peat-diggers, he has been known as the Grauballe Man ever since. Now, scientists are trying to use his incredibly well-preserved remains to learn more about how prehistoric German tribesman lived in the third century BC. 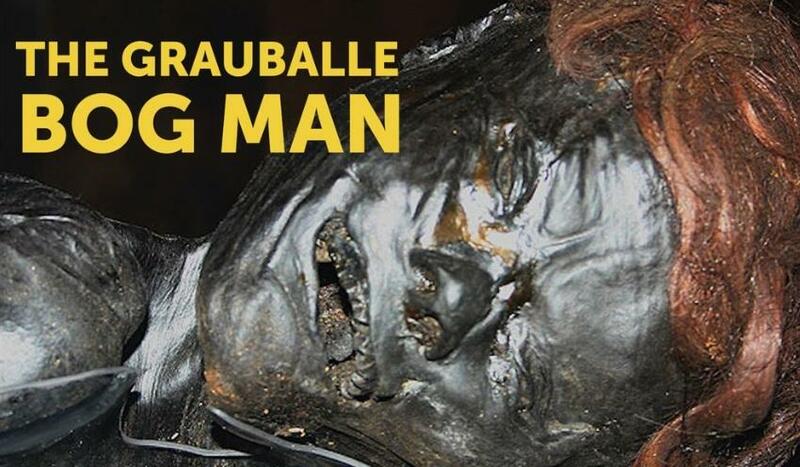 The Grauballe Man was discovered by two workmen who were digging for peat which is composed of dead and decaying vegetation and great for gardening and even fuel. It was an abrupt discovery, one of the diggers suddenly hit something with a shovel, it turned out to be an ancient body. Related coverage: Largest Ever 26,000 Pound Dinosaur Discovered Called "Ledumahadi"
The discovery led to visitors wishing for a closer look at the ancient man but one of the townsman damaged the find by stepping on his head. Amazing that the Grauballe man survived 2,000 years only to have his wig split by a clumsy busybody. Despite the damage to his head, scientists were still overjoyed at the opportunity to study the prehistoric remains. Scientists say that the reason for the Grauballe Man's preserved state is the unique conditions in bogs. In fact, many bodies have been found in Europe that were naturally mummified by similar conditions. Bogs are composed primarily of wetlands known to contain acidic minerals. They also have a sponge-like soil that is composed of dead and decaying organic matter, sometimes centuries old. Farmers who frequently use peat as fertilizer and fuel have been known to stumble across mummified corpses in Europe. Scientists estimate the Grauballe Man was around 30-years-old when he met his end. Archaeologists discovered that he did not die of natural causes but rather had his throat slit from ear to ear. The Grauballe Man was also stripped naked after his death, perhaps this helped contribute to his unusually preserved condition. He was so well preserved that scientists found his organs and even his fingerprints were still intact. After their investigation, scientists determined that he was not a manual laborer because of his soft hands but dental impressions did reveal he had often gone hungry as a child. The reason for the Grauballe Man's death is unknown and will most likely remain a secret. One hypothesis guesses that he died as a human sacrifice. It has been a popular theory that bog bodies are offerings, criminals, or leaders who were blamed by the mobs for bad crop harvests. There was no writing or symbols of any kind left behind by the Germanic tribes of the Iron Age, so his true history is likely a secret that will remain lost to time forever. Admittedly better than any mummy and far better than anything preserved 100 years ago, but far from Nearly Perfectly Preserved. ht tp s :/ /w w w. fem a .gov /national- continuity-programs Due to the lapse in federal funding, this website will not be actively managed. More Info. Integrated Public Alert & Warning System ok so i looked further ..~ last update 10/11/2018 did they alert the public not a chance......... oooops﻿ but nothing about the buried bodies that are not prehistoric , always interesting about the past ..